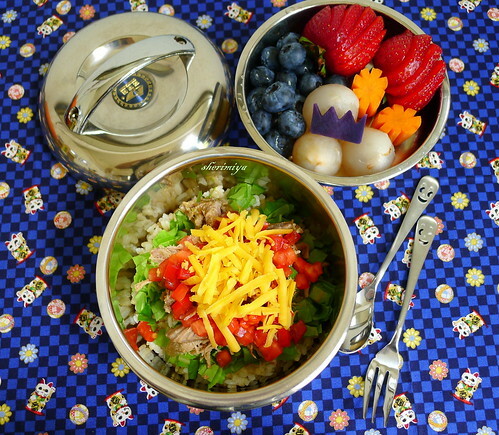 Carnitas Bowl Bento, a photo by sherimiya ♥ on Flickr. Hello! Today's bento is for MisterMan and it's a rice bowl. I made a carnitas bowl: hapa rice (half white half brown plus quinoa) topped with shredded lettuce, diced tomatoes, carnitas (slow-cooked pork fried crispy), and cheese. You could also add chopped onion and cilantro, or salsa and avocado as well. Like tacorice, it's perfect for a donburi-type bento box, and so much easier to eat than trying to hold the ingredients inside a tortilla. The kids love eating rice bowl bento. And luckily, I have this stainless steel apple bowl for him and a panda bowl for her. I love the simplicity of packing these; you can just toss everything together and you're done. The upper tier contains blueberries, lychee, carrots and strawberries, and an Okinawan sweet potato crown. They conquered their first week of school and were victorious! I only hope the rest of the school year goes as smoothly. Super glad it's Friday tomorrow though -- happy weekend friends! Holy moly already back to school?? Yay for a great week! Now that vacation is over, I'm already looking to see what's cookin' in the bento world and this is just too yummy. If you start doing pasta bentos, hit me up! My kid only *looks* asian, but she eats like an italian. lol. I always love your fresh and gorgeous bentos Sheri! Me too! Carnitas bowl is delish! amazing all the great colours and nutrients you always pack into your bentos!